The common dig at the late career of Johnny Depp is that the actor’s roles more often than not feature an overabundance of makeup and prosthetics and considerably less character depth. It’s funny, then, that Depp’s turn in Black Mass (2015) as famous Boston crime lord James “Whitey” Bulger, his best performance in several years* (which, admittedly, isn’t saying much), features a nigh unrecognizable Depp, sporting a Foxcatcher prosthetic nose and a paunch. It’s also curious that as a role viewed mostly from the outside, gleaned from the accounts of those closest to him it’s a role that’s at times distant and monolithic. Sometimes the alchemy works better than others, I guess. The plot: It’s 1975, and FBI agent John Connolly (Joel Edgerton) has returned home to Boston intent on taking down organized crime in the city. Connolly strikes a deal with Whitey Bulger (Depp), leader of Boston’s Winter Hill Gang: provide information that could help the FBI take down the Italian mafia in exchange for a blind eye towards Bulger’s own criminal activities. What begins as a beneficial arrangement for both parties takes a turn for the corrupt as Connolly movies closer through Bulger’s inner circle and the moral cost of Bulger’s information gets higher and higher. Believe it or not, Johnny Depp playing one of the most notorious criminals of the 20th century is a surprisingly quiet affair. Much like fellow Tim Burton movie regular Helena Bonham Carter, a track record of manic, capital-Q Quirky roles, make Depp’s subdued performances stand out. Where it would be perfectly understandable to indulge in some Oscar-clip shouting, Depp instead brings a quiet, collected menace that makes Bulger’s outbursts of violence that much scarier. Framed through police interviews with Bulger’s former associates, the Whitey Bulger of Black Mass is a cold, and at times inhuman force. Ruthless and bordering on monstrous (Depp’s Bulger resembles Nosferatu’s Count Orlock at the right angle), Whitey Bulger is defined by the perceptions of the people who loved, feared, or respected him and rarely by the man himself. What’s lost in the mix is Bulger’s humanity. Scenes of Bulger with his girlfriend Lindsey Cyr (an underserved Dakota Johnson) and their son reveal a tender moment tempered with the same chilling demeanor that characterizes the rest of the movie, but doesn’t bring us much closer to who Whitey is. The same applies to the scenes of Whitey with his beloved state senator brother Billy (Benedict Cumberbatch, with a Southie accent inexplicably falling out of his mouth), where the guard is never down and the script doesn’t pry. Depp is memorable, but it’s a role that examines Bulger as force of nature and as terrible Icon more than as a human. Black Mass is a movie about a force of nature acting on those near him, particularly on John Connolly. Joel Edgerton’s Connolly is the character through whom we see Bulger the most, and the film plays out as a battle for his soul; a battle that feels all too familiar at times. It might sound weird to call a dramatization of real life events derivative, but the ways in which the events are told borrow from any number of crime and gangster flicks. Connolly’s increasingly obscured morals are telegraphed through his change of clothing as through his shifting relationships with Bulger, the FBI, and his wife (Julianne Nicholson); but the language –both literal and cinematic– used to convey Connolly’s shifting allegiances feels tired in a movie landscape with both Bulger analogues like The Departed and stories of FBI agents caught up in crime like American Hustle fresh in memory. The conflict between duty, heritage, and the law is still compelling, but the concepts have been better explored elsewhere. Aside from Depp, the feather in Black Mass‘s low-rent, early 80s cap is its cinematography. Black Mass is a beautifully shot film that captures of film’s seedy bars, snow dusted streets, and fluorescent-lit offices in beautifully composed portraits. Shot by The Grey DP Masanobu Takayanagi, the camera lingers on shots in ways that are unique in modern cinema and packs shots with the visual semiotics that drive film students wild. A shot of Connolly barred by the blinds of his office window following a conversation with a fellow agent (Adam Scott, bringing trademark dry wit to his scant scenes) hints at his fate before the script does. Takayanagi’s cinematography is poetically composed without ever betraying the naturalistic feel of the film. 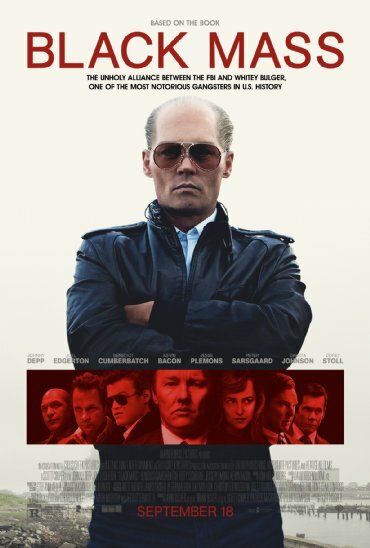 Ultimately, Black Mass is an artfully constructed film with a strong central performance that ultimately feels indistinct.There’s more than enough here to carry it into prestige season and fuel Oscar buzz, but a film that’s a better talent showcase than compelling crime drama. *Until Pirates 5 comes out and is recognized as the crowning achievement cinema, that is. Meh, I probably wont see it.